Club Penguin Cheats by Mimo777 Club Penguin Cheats by Mimo777: Club Penguin Scary Style Reviewed By You! "My favourite costume is all the scary costumes mixed together. I might wear the ghost costme with bumble bee antennas and frankenstein feet with the fairy wings. It might not be really scary but it is fun to waddle around with all my buddies trick or treating and looking all muddled up!!! Waddle On CP!!!!!" Cool sounding costumes, Evie Mary! Congrats on getting your review chosen... and the 10,000 coins! 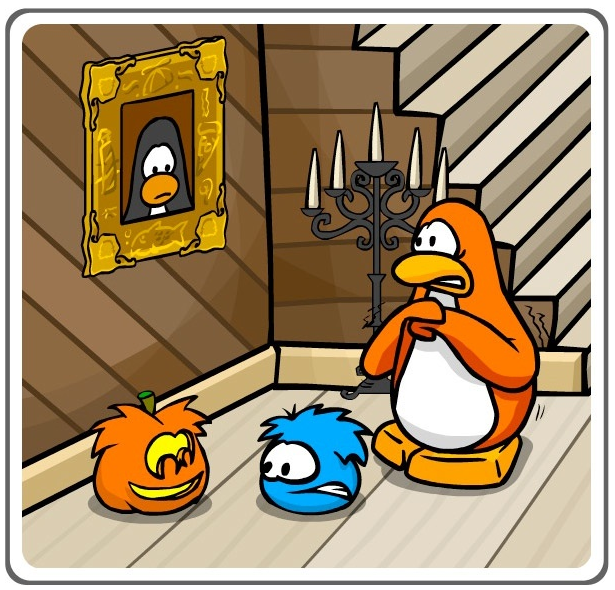 For next week, Club Penguin wants to know how you are decorating your igloo for Halloween? Next week, on Oct. 15th, Club Penguin will be having an Igloo Decorating Contest! Saweet! Are you going to enter the contest? Let me know your spooky ideas! Hi people of this world, everyone is welcome to my First Ever Birthday Party tomorrow, 7th of october. Please come. Server: Chinook. Time: 11.00am PST. Place: Dojo. Mu penguin name is Eimear456 thank you! Oh yeah and if you come, tell m if you saw this comment! Thank you!!!! i think they should release Halloween stuff for your igloo! by the way were is the moderator list? Wow! Sounds really cool. Now I just gotta keep checkin the PST Clock! BTW is today the 7th? Yeah, that sounds really cool. I hope that comes out! What do you get if you win the Igloo Decorating Contest? Coins like always probably. Hey Mimo I'm Mmmmmboy and I just wanted to let you know your blog is awesome and I'm also creating my own blog! Do you have any advice for me? Hi people of this world,everyone is welcome to my First Ever Birthday party tomorrow,7th of october.Please come.Server:Chinook.Time:11.00am PST.Place;Dojo.Mu oenguin name is Eimear456 thank you!Oh yeah and if you come,tell m if you saw this comment!Thank you!!!! Dont u have school at that time i do! cant come sorry! When is there going to be the new igloo items catalog? i know! I have school at that time! I'm lucky, because where I live matches the PST clock. :D And, congrats to the winner of Reviewed By You! It will, oh yes it will.. Your igloo also gets shown in the newspaper as well as the tons of coins. Ive tried every club penguin halloween so far and i havent one once but ill keep trying! Today is the 7th, thank you so much! It is now, 8:22am approx! Off the topic, You rock! You Stone! You PEBBLE!